Have A Blast At Your Next Party! 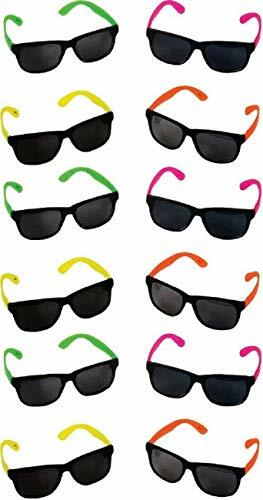 Big Mo's 36 Neon Colored 80's Style UV Protected Sunglasses Makes A Awesome Party! Big Mo's Neon Sunglasses Are Great For Any Party Or Event. They Are The Best Party Favors And Are Also Wonderful For Anytime Use. Great Dress Up Or Goodie Bag Giveaways For Pool Parties, Beach Parties, Backyard Picnics, Cookouts. Mardi Gras Festivals, Birthday Parties, Graduation Parties, Summer Parties, New Years Parties And Any Other FUN Party! Fun For Adults And Children Alike! Not Recommended For Children Under 5 Years Old. Have a blast at your party. 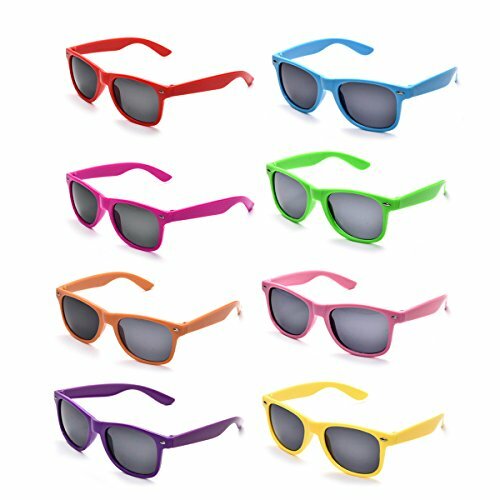 This collection of novelty sunglasses features a variety of bright neon colors on the hinges and frames. UV protected lenses.Makes great party favors! Not recommended for children under 3 years. 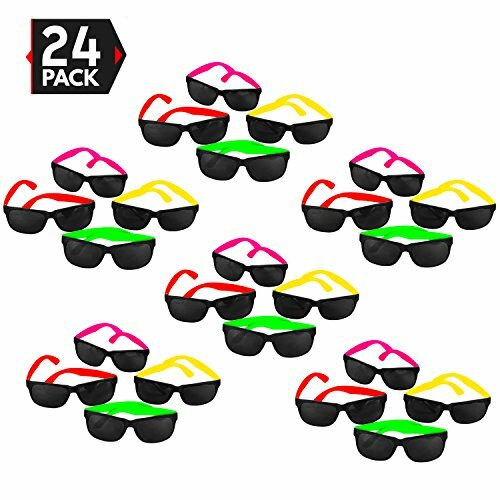 Neon Sunglasses (Pack 36) Assorted Cool Colors Neon Sunglasses Party Favors Party Pack Wholesale Bulk Pack for Adults Kids Assorted Cool Colors Neon Sunglasses-Graduation-Mardi-Gras-New Years-Birthdays. 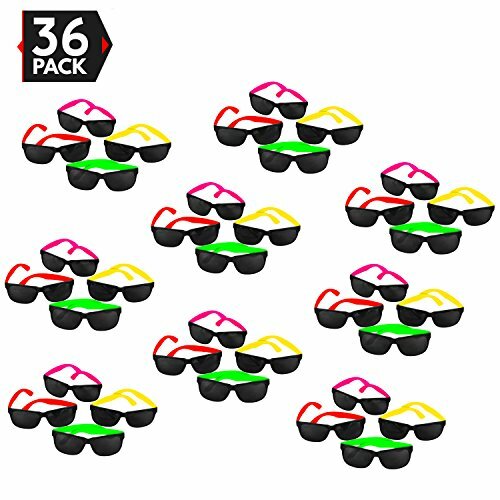 36 Per order-You get 36 Awesome NEON SUNGLASSES for each order. KIDS AND ADULTS- Fits most kids children and average size adults. Our NEON SUNGLASSES measure 5.5 Inches. 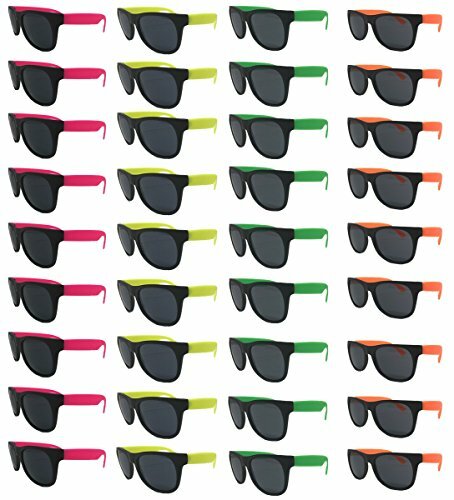 ASSORTED COLORS--Each Neon Sunglasses Party Pack will come with at least 4 different cool neon colors but we cant guarantee which colors. GUARANTEED-If you don't like our neon sunglasses, which we are sure you will, for any reason just send them back to us, no questions asked for a full refund. 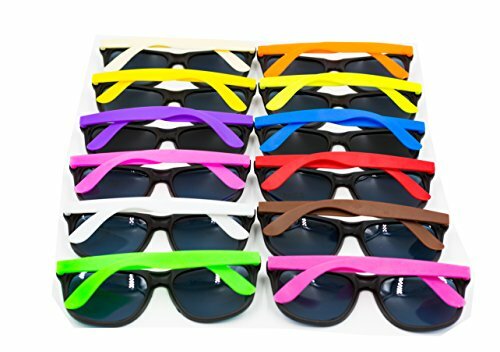 Great for Mardi Gras, Birthdays, Graduation Parties, Summer Parties, Vacation sunglasses, Memorial Day, Bachelor and Bachelorette party, 4th of July, Las Vegas trips, Photo Props. New and improved quality for 2018. 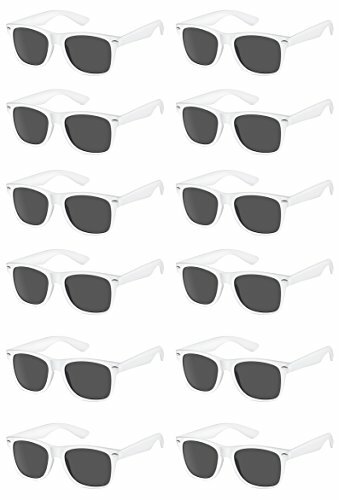 If you want to buy cheap sunglasses, sure you may find lower prices but you will regret it. 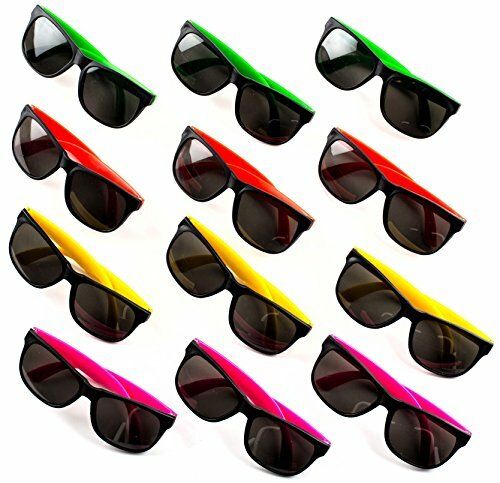 Buy our neon sunglasses with confidence knowing that you are buying a quality product.